The kitchen nook has gone through a number of looks and styles over the past few years, but I love the fact that this space is so extremely versatile with the addition of a new pillow or hanging a different piece of art. The change for this space all started when I found my new vintage runner. Far more neutral than the previous pink version that had lived there for a few years, but I often felt it was too much pink especially with our large pink rug in the adjoining living room. I do love the pops of bright pink in the new rug, but LOVE the worn neutral feel even more. It feels like home. So I have been hanging art either large enough or low enough to cover the outlet up. Finally, I was so frustrated with it, I begged the hubs to help me fix it. So my very handy husband moved the outlet down below the banquette, because who couldn’t use an extra outlet?! But then we were left with a gaping hole in the wall. Easily repaired on drywall (I say easily, ha…) but much more difficult to repair on this wall. This is the only wall in the house that has the original paneling. 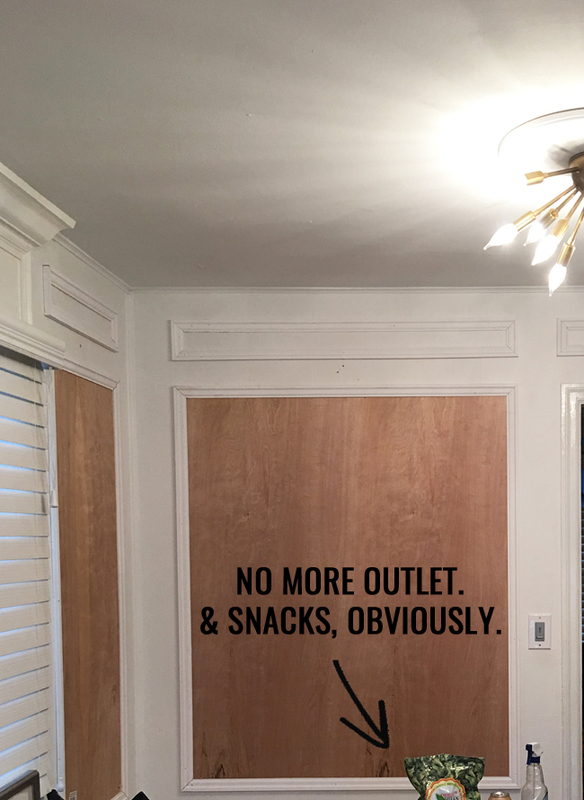 So, our solution was to add a 1/4″ piece of sanded plywood cut to size to fill the entire area of my favorite thing ever… Moulding. Of course I decided to add more panel moulding, lol. But seriously, I just have all the feels for traditional trim and details. And it now ties in so closely with the rest of the home. 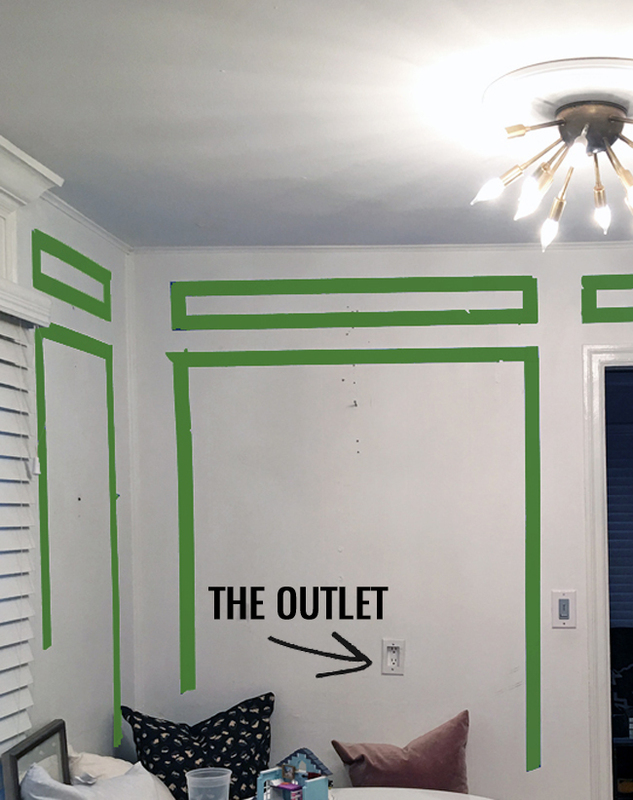 Quick tip: Being a visual person, the easiest way for me to measure for trim is to literally tape it out with painters tape & measure from there. Finally, I painted out the wall, plywood & trim. Letting the decor fall into place from there. I have had an extra roll of black faux leather upholstery fabric lying around and decided to give it a try on the cushions. I have loved our polka dots, but thought this would be a fun new look. And then added some new pillows, because I have a pillow addiction. Truth. I picked up these killer black leopard Kelly Wearstler lovelies from Little Design Co (I am not seeing them available on her site now, so they can be found here as well.). I then had the thought to add in a blush pink. Who knew I would find them for $12.99 (already with the down inserts!) from Hobby Lobby of all places. I always keep my eyes peeled in these types of stores. You never know what you are going to find. Even if I didn’t use the covers, you just can’t get down inserts for $12.99!! I then added some art. With the new panel moulding, along with the fact that I no longer had to cover that outlet I went with a slightly smaller piece. This makes sitting back on the banquette more comfortable. I hung the art using some chain & moulding hooks that I was thrilled to find! While my moulding is not traditional picture railing, these hooks have a flat top & work beautifully to keep further holes out of my newly flat plywood wall. I am loving the more sophisticated feel of the nook, and I am sure there will always be some shifting of pillows, art, etc… but for now it is staying. Black/white/pink is a winning combo in my book! You made a nice choice with the Feline Ebony pillows too. I like that the pattern reads partly as an animal print, and partly as a cool geometric. Your graphic art on top of the new molding is the icing on the cake. Aren’t small updates great for lifting the spirits? Love your artwork! Where did you get the frame for the original artwork? The piece is gorgeous! Thanks Denise. It was actually a canvas that was framed when I bought it. I didn’t love the art anymore & simply painted over it. I do believe that Framebridge has a similar frame for canvases. I love the herringbone tile in the kitchen. I have been trying to come up with a backsplash plan for my 1921 craftsman kit house’s kitchen. I’m going to work toward this concept. Thank you very much for the visuals! Always a work in progress, my house, but I love it!